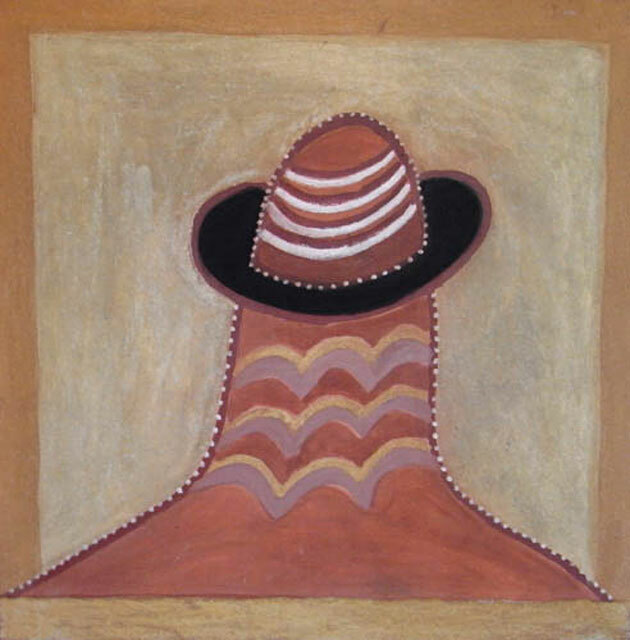 Hector Jandany, Jiwigun Hill, courtesy Coo-ee Aboriginal Art, 1997. Hector Jandany’s family history was littered with harrowing tales of persecution. Gadiya (white people) shot his grandfather and harmed his grandmother, who subsequently died in childbirth. While Hector was still in infancy, his father also died in confrontation with white people. He grew up, however, with an instinctive knowledge of country coupled with a strong Christian belief, and worked for much of his life as a cook in the stock camps, never straying far from the banks of the Turkey Creek where he had been born. Hector was a deep spiritual believer, whose faith blended his Gija upbringing and beliefs and his Christianity into a unique interpretation of Catholicism. In his fifties, inspired by his enthusiasm for ‘two-way’ education, he became the school director of the Bough Shed school which opened in Warmun in 1979. He began painting in the late 1980’s and from the outset, his work was noted for its quirky appeal and interesting narrative. Inspired by his mother’s country, the Bungle Bungles (Purnululu), he created works for Waringarri Arts in Kununurra until the Warmun Arts Centre began operating out of the old post-office building at Turkey Creek. Like his contemporaries, Hector showed an immediate preference for painting with traditional ochres. He believed that by using earth pigment ‘you can feel that paint, you can feel that country’. He treated the surface of his work as if it were sacred, touching and rubbing his hand gently across it reverently. He experienced a tangible connection to country through painting that reflected his commitment to maintaining his spiritual obligations. One aspect of this spirituality is seen in his magical Krill Krill paintings, such as those created for the ceremony that took place at Warmun in 1994. In these stark works on board, his depiction of ancestral owl spirits bears comparison to early Christian icons. Hector, always sensitive to the spiritual meeting point between two vastly different traditions of religious practice, enlivened this cross fertilisation with an animated sense of humour. In life he could be profoundly funny in ways that belied the pain of his early childhood. He was loved for the gentle way in which he could make the driest comments on people’s odd behaviour, the hazards of old age, or ‘those mad bastards in Canberra’. Hector was one of the last of the real bush painters. He used traditional spinifex or red and white gum glue as the binder for the ochres used in his art. The work illustrated was created in 1997 when the artist was 73 years of age. It depicts Jiwigun Hill in natural earth pigments on a canvas measuring 100 x 100 cm. According to the Dreamtime legend connected to this area, Jiwigun Hill was a refuge for all of the people and animals caught in a great flood. They camped above the dry ledge depicted as a black band rimmed in brown. Below, the rising floodwater can be seen lapping beneath the ledge. His highest price at auction was achieved for a work that was painted for Easter ceremonies at Warmun in 1993. Ascension, an unusually large canvas, measuring 186 x 190 cm, sold for twice its high estimate, achieving $36,925, when offered at Sotheby’s July 2005 auction (Lot 43). The painting depicts a Christian theme in a highly original way that inextricably binds the narrative with Gidja lore, a hallmark of many of Hector’s best works. Hector was not a prolific painter and only 72 works have been offered for sale at auction during the past two decades. His success rate was quite good at 72% with 38 of 53 works sold until 2008. In 2008, only two of the nine works offered were sold however, both of these entered his 10 highest sales results. This incongruity saw his career clearance rate drop dramatically to 65% yet his average price jumped by more than $600. (The 11% increase in his Art Market Rating (AIAM100) lifted him 7 places, from 81st to 74th amongst most successful Aboriginal artists of all time.) Though four of his works have sold for more than $21,000, the remaining six in his top 10 results have achieved less than $12,000 due to the fact that while major works do exist, they are very tightly held by those collectors lucky enough to own them. Hector’s only solo exhibition came in the last 12 months of his life at Raft Gallery in Darwin. Nevertheless he was a regular finalist in the Telstra National Aboriginal and Torres Strait Islander Art Award and his art was included in the landmark exhibitions Aboriginal Art and Spirituality held at the High Court in Canberra, and Images of Power at the National Gallery of Victoria (as well as the books published under the same titles). Throughout his career Hector Jandany played second fiddle to many of the Warmun movements brightest stars. Nevertheless, the eccentricity of his compositions, their variety and sensitivity, made his works of art particularly memorable and interesting. He passed away in 2007 and left a generous, if not large, body of unique works. Though many are relatively small, they are highly desirable and will always be relatively affordable. No Kimberley art collection could ever be considered complete without a good example of this great old artist’s work.